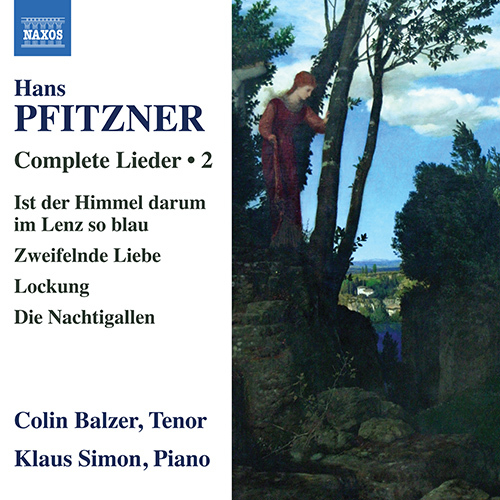 This second volume of Pfitzner’sÂ Complete LiederÂ (Volume 1Â is on 8.572602) covers the period between 1884 and 1916 and shows why he was considered such a key figure among composers of his generation. A central theme of the songs is the archetypical Romantic focus on the portrayal of nature as a reflection of human feelings. The youthful and enduringly popularÂ Ist der HimmelÂ darum im Lenz so blauÂ (‘Is the sky so blue in the spring’) reflects his greatest qualities as a song composerâ€”a memorable tune and rich, flowing harmonies. Favouring the bold use of colour, Pfitzner’s songs are characterised by a lively, pulsing rhythm and sweeping, ecstatic melodies.